The Curmudgeon is a monthly column on music trends, history and developments. Read more from the archive here. 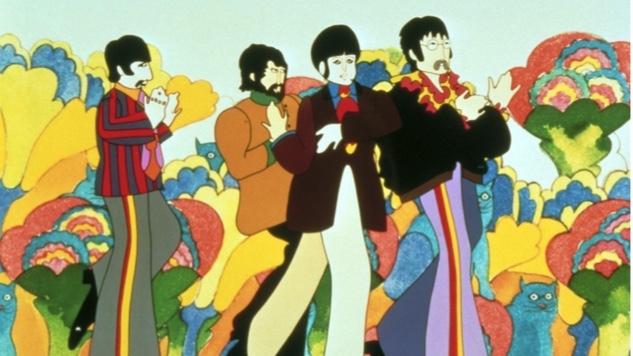 The Yellow Submarine movie is being re-released in theaters this summer, and you shouldn’t miss the chance to once again see Heinz Edelman’s visuals splashed across a big screen in a dark room and to hear the Beatles’ music pumped out through big speakers. The film is still perhaps the best argument for the psychedelic arts. Whether it’s American Indians swallowing peyote as part of a sacred ritual in the Southwest desert or middle-class kids swallowing blotter paper as part of a weekend party in a Northeast dorm, psychedelic drugs are designed to allow the user to step outside the real world to see it better. If the familiar elements of the world are disarranged, maybe the unfamiliar elements will reveal themselves. Psychedelic music does the same thing for the same purpose—and is much safer as well. But people step out of reality for different reasons. Romantics such as Paul McCartney, Brian Wilson and Wayne Coyne want to pull back the curtain of quotidian drudgery—with the help of cello, theremin and reverse-running tape—and reveal a utopian world of generous lovers, whimsical eccentrics and golden beaches. By contrast, misanthropes such as Roger Waters, Lou Reed and Thom Yorke aim to rip off our blinders—with the help of squealing guitar feedback and distorted drones—and show us a dangerous world of heartless hustlers, ruthless rulers and faithless friends. It’s easy to forget the bleak moments in Yellow Submarine: the grim industrial landscape of post-war England that opens the film and the assorted depictions of loneliness in the “Eleanor Rigby” segment. But those scenes are trumped by the fauvist landscapes of Pepperland, where each tree and hillside changes color with every bar of music. “Picture yourself in a boat on a river with tangerine trees and marmalade skies,” John Lennon sings, “cellophane flowers of yellow and green towering over your head.” The music as well as the movie deliver on his promise. Those lyrics come from “Lucy in the Sky with Diamonds,” and you can accept Lennon’s claim that the song’s LSD initials are a mere coincidence or not, but the drug and the music are obviously linked. In the same year the film was released, Pink Floyd released its second album, A Saucerful of Secrets, which boasted harmony-warping peals of guitar noise and a blurry photo montage by artist Hipgnosis on the cover. Waters even mentioned “Lucy in the sky” on his song “Let There Be Light.” But while the Beatles’ vision of a world beyond what we know was utopian, Pink Floyd’s was sinister, depicting the hidden world as even more menacing than the known world. Wilson and Reed were both geniuses of a kind, but they had very different outlooks which produced very different kinds of psychedelia. And it’s not just the lyrics; it’s also the use of melody. Wilson, like McCartney, loved pleasurable tunes, and that delight gave his songs a childlike appreciation for the world’s possibilities. Reed was less interested in melody and more interested in sonic textures that ground and grated. Out of that tension came a psychedelic music quite unlike the Beatles/Beach Boys model. This same dichotomy carries over into the present. The Hookworms’ new album, Microshift, which has been getting rave reviews, is from the misanthropic wing of psychedelia. The British quintet has good reason for its pessimism; its studio and much of their past recordings were destroyed when the Aire River flooded near Leeds in 2015. But their gloomy outlook preceded the washout; after all, they named themselves after an intestinal parasite that burrows through the skin and takes up residence in the guts, where it eats up all the available iron. The album’s opening track, revealingly called “Negative Space,” opens with more than a minute of robotic vocals and synths before lead singer Matthew Johnson sings, “In a negative space, I want to leave it …, a pain that’s no savior, a pain that’s not ours.” The nightmare scenario is underlined by crashing synth chords and grinding guitar riffs. There’s a redeeming tunefulness to the proceedings, but Johnson’s forlorn cry of “I still hear you every time I’m down” remains unanswerable. Such dystopian views of the world are perhaps best delivered through the medium of psychedelic music, which can exaggerate small tendencies into large ones and thus uncloak the valid reasons for paranoia. Such warnings about the world’s dangers don’t have to descend into Waters’ portentous crankiness. If such songs pit caution of danger against hope for redemption, as the best songs from Reed, Yorke and Johnson do, they can be exhilarating. But the more optimistic strand of psychedelic music provides not just hope but also fuel for redemption. One can’t help but have a brighter outlook on the future after imbibing the sounds of the Beatles, Beach Boys, Grateful Dead or Flaming Lips. One of the year’s best albums, Laura Veirs’ The Lookout, is a welcome addition to that lineage. Veirs is best known as one third of the folk-music trio, case/lang/veirs, which recorded an album and toured in 2016. But Veirs’ solo albums have boasted folk-rock arrangements with a psychedelic twinge and contributions from such like-minded Pacific Northwest collaborators as The Decemberists and Bill Frisell. “Margaret Sands,” the new album’s opening track, is based on a T.S. Eliot poem and depicts a woman’s decomposing body on an ocean beach, not with a sense of horror but a sense of strange wonderment at nature’s processes. The pretty melody is gradually bent into unusual harmonies and is taken on an eerie tangent by Jon Neufield’s archtop guitar and Jon Hyde’s pedal steel. There’s a ghostly cover of the Grateful Dead’s “Mountains of the Moon.” There’s a disorienting evocation (with vocal help from Sufjan Stevens) of a sentinel standing by a “Watch Fire,” wondering what predators, animal or human, might be “beyond the circle of light … in the gloom in the thorns and briars.” There are trips to “The Meadow” and “The Canyon,” natural refuges which seems like far-off planets with their absent walls, towering skies and disordered chords.